Believe it or not, we don’t really hear those words that often, and we are a custom A/V company. Most clients lead with phrases like, “I’m not really an audiophile.” Little do they know, good speakers are really about creating an experience, much like a movie theater. When you are at a movie theater you aren’t thinking about the speakers, but you are engrossed in the movie, partially because of the experience those speakers help to create. On a recent project in Lucas, TX, we were lucky enough to work with a client who demanded that his family room sound, and look, great. Typically when you think of great sound you think of giant speakers that take up space and look awful, but that is where Audio Video Innovations came in. 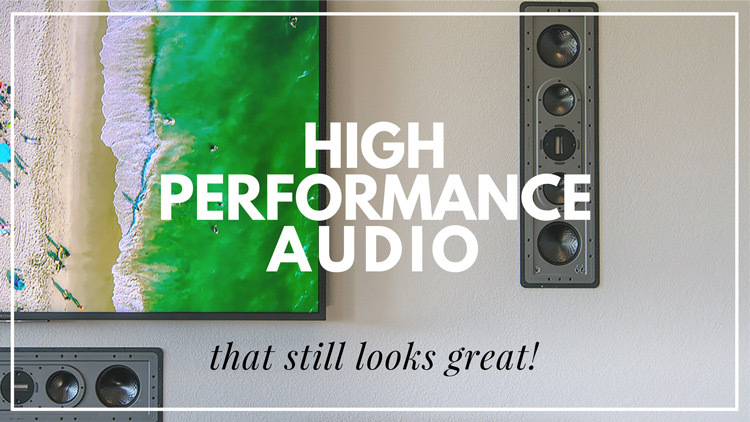 We were able to help our client find incredibly high quality surround sound speakers that installed directly into the walls, along with a pair of subwoofers, also installed in the walls. Because of the height of the ceiling the rear surround sound speakers also had to go in the walls. 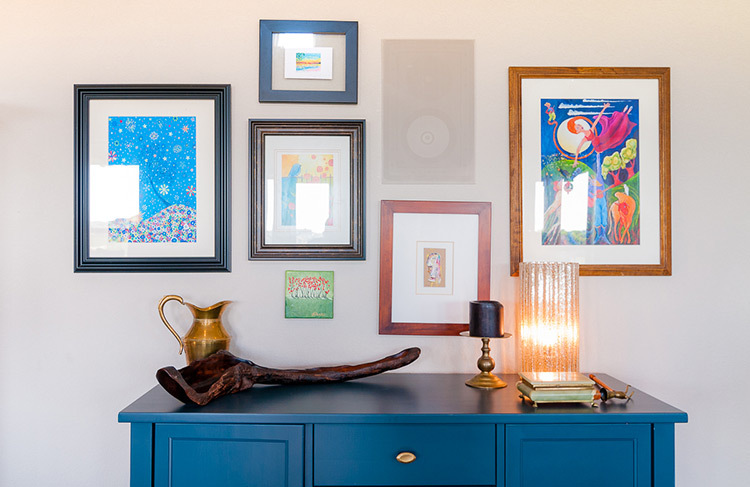 The speakers were painted to match the walls, but the client went a step further by incorporating the speaker into a gallery wall, disguising it even more effectively. All of the speakers are from Monitor Audio, a British loudspeaker manufacturer with 40+ years of experience. The front speakers (Monitor Audio CP-IW460X) are almost three feet tall, but because they are flanking an 85” Sony 4K TV, they look perfectly in scale on the large front wall. The rear speakers (Monitor Audio CP-WT380) are smaller, but still provide full range sound, at least to the point where the two in-wall subwoofers take over. The subwoofers, also custom painted, are placed low to the ground, and largely concealed by furniture to minimize their aesthetic impact. 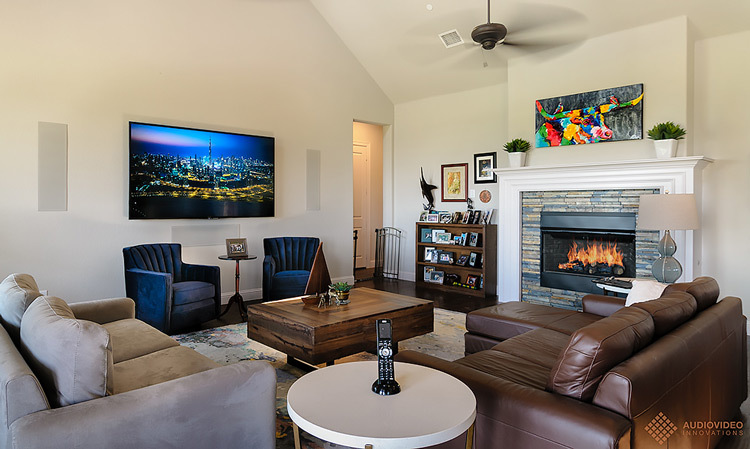 Beyond the incredibly family room “theater” the clients also have an ELAN smart home control system that is responsible for music throughout the house, surveillance cameras, security, thermostats and lighting. 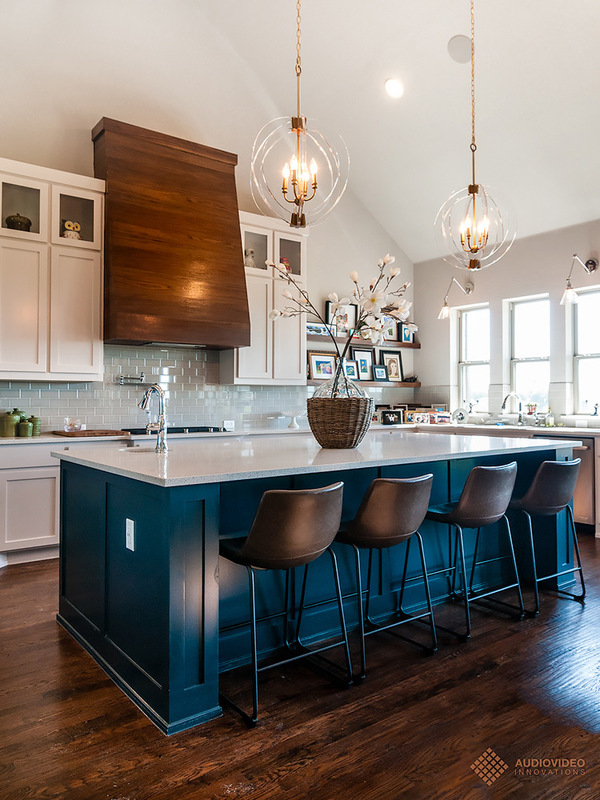 The end result is a home that sounds great, looks great, and makes their lives easier. Who wouldn’t want that? If you are interested in any of the products or services mentioned above, please contact us today at 972.529.4470 or by email at info@avinnovations.net to setup your free consultation.